It must have been 9th grade, or somewhere around there, when my English class read Animal Farm and began breaking down the meaning of the story. Just in case a very small percentage of you don’t know what it’s about, the story mirrors the Russian Revolution, including the individuals & groups that set the stage, carried out the revolt, and created a community in the aftermath. We were all given a person or class of people, instructed to study them, and then relate our information to the character in the book who was crafted to represent them. I think I got Trotsky, not an incredibly exciting prospect to a 14-year-old, but I remember being pretty invested in the idea that this simple book held so much meaning. Having read it many times since then, I can still enjoy it, but perhaps on more levels now; as an entertaining story, as a critique, as a history, and as a novel that will never grow old. On the Manor Farm, the traditional balance of power is about to shift. Jones, the owner of the farm, has been neglectful of his duties. He’s a drunk, a poor worker, a bad master, and takes the animals of the farm for granted in ways that cannot be tolerated much longer. Old Major, an ancient boar, predicts that some day in the future when the time is right, animals will rise up and overthrow their human dictators, that the land will belong to the workers, that every animal will be equal and free. After his death and under the leadership of two male pigs named Napoleon & Snowball, the Revolution comes sooner than anyone expected. With relative ease, Jones is expelled and Manor Farm is renamed Animal Farm, much to the delight of the freed sheep, horses, cows, dogs, and pigs. And although life has new purpose and the workers are all equal under the new law, not everyone is content to do his fair share of the work. The pigs, especially Napoleon, become increasingly privileged, leading ultimately to a farm that doesn’t seem so different after all. It’s fascinating to go through the list of characters and match them up with who they represent, from Stalin, Marx, & Lenin to the workforce, organized religion, and Tsar sympathizers. You could spend weeks, a lifetime, studying the allegorical meaning of this book, and it’s not just conjecture, Orwell was very clear with what he was attempting to do with this story. But, as with all great literary works, there’s so much more to this book than meets the eye, or even reveals itself under scrutiny. There’s a simple story here that can be read over & over, appreciated in different ways at different ages, and that can display a large number of morals based on how you perceive the events. Yes, the Russian Revolution is the foreground, but there’s more in the background, creating a multi-dimensional novel that’s only a 100 or so pages long. 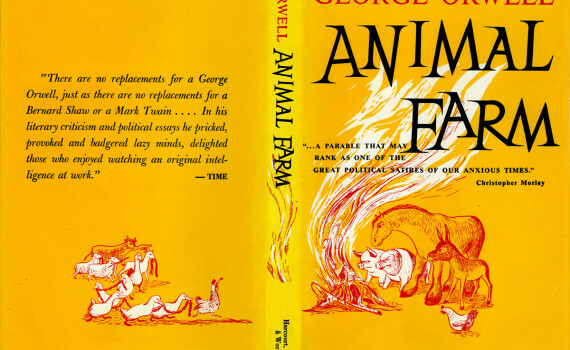 Animal Farm is one of the great classics of English literature, one that should never go undervalued.